This week, Scottish band Twin Atlantic released their new record, ‘Vivarium’. Sean recently asked bassist Ross McNae about the new record, working with producer John Travis, the Glasgow music scene and the bands current UK tour. 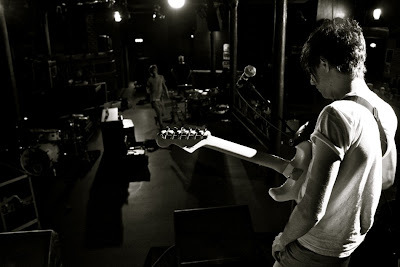 Ross: I’m Ross McNae and I play bass and piano for Twin Atlantic. R: None of the bands we played in before really sounded like Twin Atlantic, no. I think that’s the reason the band came to exist though. We were all individually fed up with what we were doing musically and wanted to forge a different path for ourselves and shared the ambition and work ethic that other people we played with before had lacked I suppose. R: Quiet – Loud. Pop – heavy Rock. Instrumental – vocal madness. I think we try and reach extremes and never get stuck doing the obvious. We’re all about the song too. The idea is that the music really matches the mood of the lyric and if the content changes the music heads in an other direction. ATP: You’ve just released your new record, ‘Vivarium’. You recorded it in LA. How was that? R: Vivarium is a really proud moment for us all as we’ve essentially been aiming for this since we first formed. The idea of having a record in the shops for people to buy and to extensively tour is where we wanted to be. It’s a great feeling after two years of really hard work. Couldn’t be doing it with better people around us either. Going to record in America was wild. I don’t think we ever imagined we would get the chance to go there as a band let alone spend three months there recording. R: Working with John Travis was really hard work. He’s a great guy but he pushed us hard. We needed somebody like that working with us who would let us try things and spend time really perfecting things. I think we’re all really proud of the way the record sounds too. We went in wanting to make an organic record true to our live shows and I truly believe we did. ATP: I hear ‘You’re Turning Into John Wayne’ is about your experiences over in the States? R: That song is more about Americanisation than our time in America. It’s just that when you stop and think, American culture is everywhere you look intertwined in all of our lives in sone way or another and it’s a commentary on that I suppose. I suppose it’s partially a wake up to call to the rest of the world to stop being led so easily and to America to realise that they have this control and to use it wisely and not abuse it. I think it’s open to interpretation. Make of it what you will ..
ATP: Which song from ‘Vivarium’ would you define as your sound? R: I think “Carribean War Syndrome” defines Twin Atlantic for me. It’s the amalgamation of all the things we love to do musically all rolled in to one twisting, winding journey. ATP: You recently covered The Beatles’ ‘Let It Be’. Was there any reason for covering that specific Beatles song? R: Well it was Beatles day on the 9th of september and we were doing a cover for Radio Scotland. So we thought it would be fitting to cover that band, and ‘Let It Be’ is just a timeless classic that we all love so we thought we’d have a bash. We recorded it with our good friend Bruce Rintoul in Glasgow and Eric Stenman mixed it. Really chuffed with the way it sounds. ATP: You’ve been pretty busy this summer, playing shows at T In The Park, Sonisphere, Download and supporting Taking Back Sunday. How did these shows go? Any stand out memories? R: This summer has been great. We’ve been out playing loads and over to Germany for some festivals too which was great. Everythig was a highlight in it’s own right. I don’t think you can look passed T in the Park for a band from the central belt of Scotland though. Highfields Festival was crazy in Germany too. We were really surprise all summer by the amount of people who were giving up half an hour of their day to come see our festival shows. Really means a lot when people come along. ATP: You’re now on a headline tour. Do you have anything special lined-up? R: Well this tour has been great so far and hopefully will continue to be. We’ve had unbelievable bands out supporting us which always makes shows great. Ghost of a Thousand, Sucioperro and Failsafe. Awesome. R: We did a little show in the winter gardens at The Peoples Palace on Glasgow Green for our album launch. There was two hundred wristbands and people amazed us as they queued outside Avalanche and HMV Records from stupid o’clock in the morning for them. The venue was awesome as it was a massive tropical vivarium which tied in with our record. We had girlfriends, friends and family there too so it was really special for us. R: The rest of this year is going to be filled with touring the record and writing the next one. We’re not going to leave it for ages before we go in ad get the next one recorded so that’ll hopefully be reasonably early in 2010 that we get cracking with it. Loads of great ideas flying around already so we’re excited! Can’t wait to just get out on the road properly until the end of the year and get this record heard by as many people as possible. R: Thanks for chatting to us. Take it easy. Our record’s out now so have a listen and if you like what you hear we’ll hopefully see you at a show sometime soon. Cheers. Twin Atlantic To Play Machester's "In The City' Showcase! Rock Sound is proud to host a showcase at this year’s In The City International Music Conference, the annual industry event held in Manchester each October. This year the convention has opened up to members of the public and one £20 ticket is all it takes to get you into venues all over the city to watch the finest new bands showcasing their talents. quartet played with the striking image of the Winter Gardens’ massive Victorian greenhouse and lush, towering evergreen trees behind them. The gig was worth it just to see a performance in such a space. For the hundred-odd young fans in attendance, however – some of whom had apparently queued since morning for this early evening show – the scenery was the last thing on their minds. As befits a group who have supported the likes of Smashing Pumpkins and their own spiritual predecessors Biffy Clyro, Twin Atlantic inspire a particularly devotional kind of follower. As Queen’s I Want to Break Free accompanied them onstage, the crowd squealed and cheered. From the start they vigorously slam-danced into one another, with one security man rather oddly dressed in a green boiler suit and a decorator’s mask making to weed out troublemakers who might be getting a bit overexcited, before relenting and letting them rejoin the melee. The music itself is not quite epic enough to follow Biffy onto arena stages yet, but tracks like Time is the Enemy, Better Weather and Audience & Audio are polished and precise alternative rockers that demand a larger forum. Not, mind you, that they are ever likely to play a venue more striking than this. Glasgow’s Twin Atlantic are one of the most exciting bands you’ll hear for some time. They’ve been attracting comparisons to Biffy Clyro for obvious reasons – they’re Scottish of course, and they too thrive on making intelligent, explosive rock – but that’s nowhere near the whole picture. There’s something instantly likeable about these songs that’s entirely Twin Atlantic’s own doing. Maybe it’s the perfect balance of complexity, melody and quirkiness in ‘You’re Turning Into John Wayne’, or the straightforward, sparkling optimism in ‘Lightspeed’ – but whatever it is, they’re clearly on to a winner. This debut mini-album is surely the beginning of great things. Like a tuned-up Fire Engines colliding with Biffy Clyro, the much-touted Glasgow four-piece live up to the hype, delivering a debut bristling with power and poetry. Lightspeed is precisely the pace at which the record begins, and maintains with an almost uncomfortable intensity. Sam McTrusty sings with exaggerated enunciation that spits every syllable like a call to arms. “Is there anybody out there?” he exclaims on Audience And Audio, an early single here reinvented with passion and panache. The band augment the customary guitar, bass and drums with cello and piano, lending an airiness to the closing Better Weather and density to the record’s centrifugal force, Caribbean War Syndrome. Rhythmically twisting and turning, powered by the tumultuous drumming of Craig Kneale, this is as monstrously ambitious as anything attempted by Muse, but without the wacky conspiracy theories. Twin Atlantic’s mini-album Vivarium is now available on spotify, along with the lightspeed b-side. Cheers to colinartl in the forum for posting this.